Humans have come to dominate the world largely due to our intelligence relative to other species. Where does this tremendous cognitive flexibility come from? Many have considered prefrontal cortex as the origin of this boost in intelligence, yet it has remained unclear how this chunk of brain tissue could drive intelligent behavior. In a recently published study we used fMRI (functional magnetic resonance imaging) along with advanced machine learning approaches to read out what information is processed in prefrontal cortex during intelligent behavior. We focused on one of the most remarkable abilities indicative of human intelligence: rapid instructed task learning (RITL). This is the ability to quickly learn new tasks from instructions. For instance, we use it to learn to use new technology (e.g., a new smartphone) and when learning to play a new game (e.g., Monopoly). This ability may seem mundane because it’s familiar, but it’s actually quite remarkable both computationally and in terms of evolution. Computationally it’s remarkable because even modern computers can’t match the RITL abilities of human children. Evolutionarily it’s remarkable because other primates take much longer to learn many tasks that we can perform immediately upon hearing instructions. We have investigated RITL in the past. What’s different here is that we were able to tie what information is in prefrontal cortex (instead of just how active it is) to how accurate a person is on a given trial. In other words, we were able to see the information processing in prefrontal cortex that drives successfully intelligent task performance . We started out finding the brain regions (regions of interest; ROI) that were more responsive to novel that practice tasks. This helped us isolate RITL from general task processing. We found a variety of prefrontal areas that were preferentially involved in novel relative to practiced task performance (Figure 1). We wanted to test whether any of these brain regions were especially important for RITL behavior. We therefore tested if there were any regions that also 1) represented task information and 2) were sensitive to task accuracy. We found three brain regions that showed all of these properties. Surprisingly, all three regions were in left anterior prefrontal canadian roulette cortex (regions 1, 4, & 8 in Figure 1). Given how close these regions were to each other, we thought they might actually be the same large brain region. When we checked their overlap with brain connectivity patterns, however, we saw that they are each part of a different network (Figure 2). This suggests there are three nearby regions in left anterior prefrontal cortex that play an especially important role in flexible and intelligent behavior in humans. See the full scientific article for more info. It’s hard to believe we started this blog over eight years ago – all the way back when we were grad students. What a long way we’ve come. Patryk is now Director of R&D at Brain Corporation, while Michael is an assistant professor at Rutgers University. Today we are relaunching Neurevolution, with a new design and plans for more frequent posts. Why today? It’s not only Albert Einstein’s birthday, but a very special Pi Day (3/14/15). It is our hope that this blog continues to provide a forum for brain research knowledge and ideas that is more accessible to the general public than our scientific publications and presentations. We hope you enjoy – please contact us with any questions, ideas, or requests for the blog. The frontoparietal control system is to the mind what the immune system is to the body. It may oversimplify the situation, but we’re finding it’s a useful metaphor nonetheless. Indeed, we’ve just published a new theory paper explaining that there is already an avalanche of evidence supporting this metaphor. Even though much work is left to fully establish the theory, we’re very excited about it as it appears it can explain much that is mysterious about mental illnesses. Most exciting is that the theory may unify understanding and treatment of all mental illnesses simultaneously. Of course mental illnesses are very complex and problems in most parts of the brain can contribute. 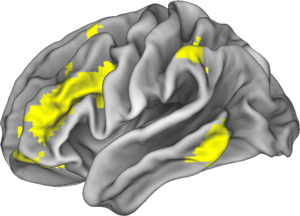 However, recent findings suggest a particular brain network may be especially important for predicting and curing mental disease: the frontoparietal control network (see yellow areas in figure). We and others have found that this network is not only highly connected to many other parts of the brain (i.e. its regions are hubs), but it also shifts that connectivity dynamically to specify the current task at hand. This means that any particular goal you are focusing on – such as solving a puzzle or finding food or cheering yourself up when you feel sad – will involve dynamic network interactions with this network (to maintain and implement that goal). 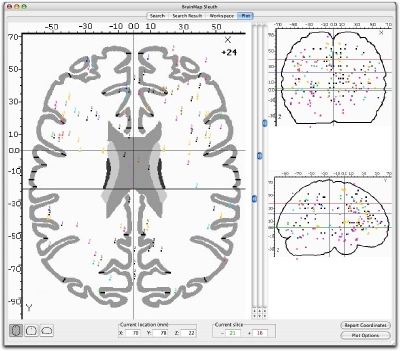 Applying this basic understanding of goal-directed thoughts and actions to mental illness, we realized deficits in this brain network may be critical for explaining many of the cognitive symptoms – such as the inability to concentrate on the task at hand – experienced across a wide variety of mental diseases. Further, we realized that many of the emotional symptoms of mental disease are indirectly affected by this network, since emotional regulation (e.g., reducing phobia-related anxiety) involves brain interactions with this network. This suggests this network may regulate symptoms and promote mental health generally, much like the body’s immune system regulates pathogens to promote physical health. Another way to think of this is in terms of an interaction between a regulator like a thermostat and a thing to be regulated like the temperature in a room. 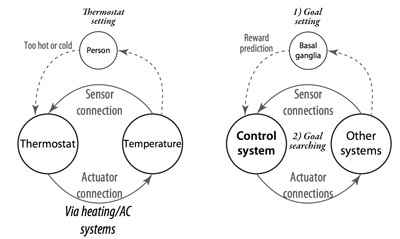 Similar to the regulation of temperature, the frontoparietal system sets a goal to a range of distributed brain activity patterns (like setting the goal temperature on the thermostat), and the system searches for activity patterns that will make the dysfunctional brain activity patterns shift toward that goal. As covered in our theory paper, it is well established that the frontoparietal system has all the key properties of a regulator: it maintains goal information, it has access to many other parts of the brain, and it affects distal parts of the brain according to the maintained goal. Further, there is evidence that things like emotional regulation during cognitive behavioral therapy increase activity in the frontoparietal system, suggesting this brain system is working harder when cognitive strategies are used to facilitate mental health. Perhaps the most exciting prediction of this theory is that enhancing the frontoparietal system may reduce all symptoms of all mental diseases using a single treatment. This is because the frontoparietal system is domain general, meaning it directs goal-directed processes across all aspects of the mind and therefore all possible mental symptoms. In practice there will certainly be exceptions to this, yet simultaneous progress on reducing even just 50% of symptoms would be a tremendous advance. How might we enhance the frontoparietal system? Perhaps using drugs that differentially influence this system (e.g., dopamine agonists) or direct stimulation of the system (e.g., using transcranial magnetic or current stimulation). Since the frontoparietal system can be reconfigured using verbal instructions, however, building on carefully structured talk therapies may be an especially specific and effective way. In particular, the frontoparietal system is known to implement rapid instructed task learning (RITL) – a way for the brain to implement novel behaviors based on instructions. Ultimately, this theory suggests the proper combination of frontoparietal system enhancement through direct influence (drugs and/or stimulation), talk therapy, and symptom-specific interventions will allow us to make major progress toward curing a wide variety of mental diseases. I’m excited to announce that my latest scientific publication – “Multi-task connectivity reveals flexible hubs for adaptive task control” – was just published in Nature Neuroscience. The paper reports on a project I (along with my co-authors) have been working on for over a year. The goal was to use network science to better understand how human intelligence happens in the brain – specifically, our ability to rapidly adapt to new circumstances, as when learning to perform a task for the first time (e.g., how to use new technology). 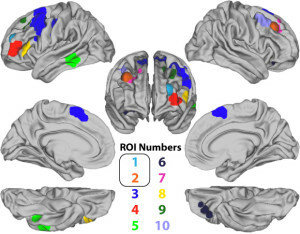 The project built on our previous finding (from last year) showing that the amount of connectivity of a well-connected “hub” brain region in prefrontal cortex is linked to human intelligence. That study suggested (indirectly) that there may be hub regions that are flexible – capable of dynamically updating what brain regions they communicate with depending on the current goal. Typical methods were not capable of more directly testing this hypothesis, however, so we took the latest functional connectivity approaches and pushed the limit, going well beyond the previous paper and what others have done in this area. The key innovation was to look at how functional connectivity changes across dozens of distinct task states (specifically, 64 tasks per participant). This allowed us to look for flexible hubs in the fronto-parietal brain network. We found that this network contained regions that updated their global pattern of functional connectivity (i.e., inter-regional correlations) depending on which task was being performed. 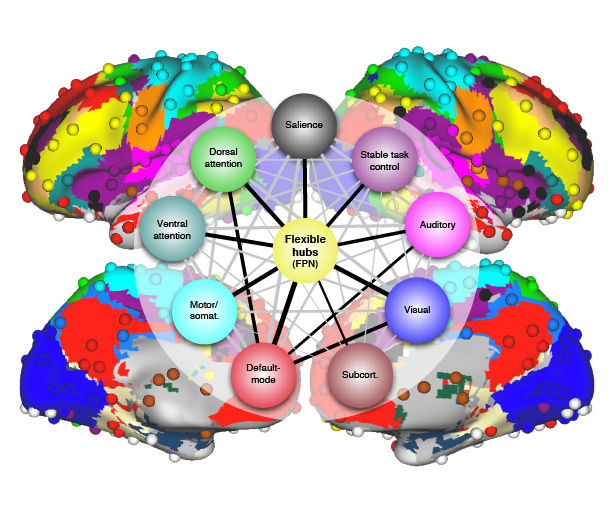 In other words, the fronto-parietal network changed its brain-wide functional connectivity more than any other major brain network, and this updating appeared to code which task was being performed. 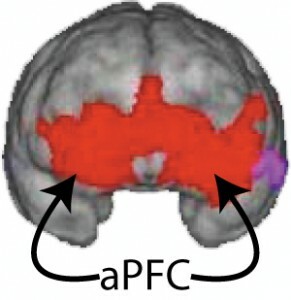 Prefrontal and parietal cortices form a network with extensive connections projecting to other functionally specialized networks throughout the brain. Incoming instructions activate component representations – coded as neuronal ensembles with unique connectivity patterns – that produce a unique global connectivity pattern throughout the brain. 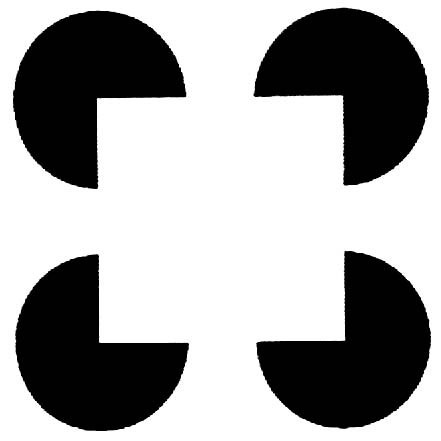 Since these component representations are interchangeable it’s possible to implement combinations of instructions never seen before, allowing for rapid learning of new tasks from instructions. This study was highly hypothesis-driven, as it tested some predictions of our recent compositional theory of prefrontal cortex function (extended to include parietal cortex as well). That theory was first proposed earlier this year in Cole, Laurent, & Stocco (2013). Also, as described in our online supplemental FAQ for the paper, we identified ‘adaptive task control’ flexible hubs, but there may be other kinds of flexible hubs in the brain. For instance, there may be flexible hubs for stable task control (maintaining task information via connectivity patterns over extended periods of time, only updating when necessary). See our online supplemental FAQ for more important points that were not mentioned in the journal article. Additional information is also available from a press release from Washington University. A new study – titled “Global Connectivity of Prefrontal Cortex Predicts Cognitive Control and Intelligence” – was published just last week. In it, my co-authors and I describe our research showing that connectivity with a particular part of the prefrontal cortex can predict how intelligent someone is. We measured intelligence using “fluid intelligence” tests, which measure your ability to solve novel visual puzzles. It turns out that scores on these tests correlate with important life outcomes like academic and job success. So, finding a neuroscientific factor underlying fluid intelligence might have some fairly important implications. It turns out that it’s relatively unclear exactly what fluid intelligence tests actually test (what helps you solve novel puzzles, exactly? ), so we also measured a more basic “cognitive control” ability thought to be related to fluid intelligence – working memory. This measures your ability to maintain and manipulate information in mind in a goal-directed manner. 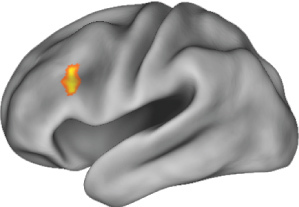 Overall (i.e., global) brain connectivity with a part of left lateral prefrontal cortex (see figure above) could predict both fluid intelligence and cognitive control abilities. What does this mean? 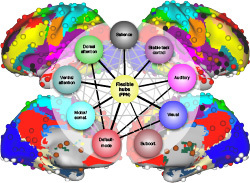 One possibility is that this prefrontal region is a “flexible hub” that uses its extensive brain-wide connectivity to monitor and influence other brain regions in a goal-directed manner. This may sound a bit like it’s some kind of “homunculus” (little man) that single-handedly implements all brain functions, but in fact we’re suggesting it’s more like a feedback control system that is used often in engineering, that it only helps implement cognitive control (which supports fluid intelligence), and that it doesn’t do this alone. Indeed, we found other independent factors that were important for predicting intelligence, suggesting there are several fundamental neural factors underlying intelligence. 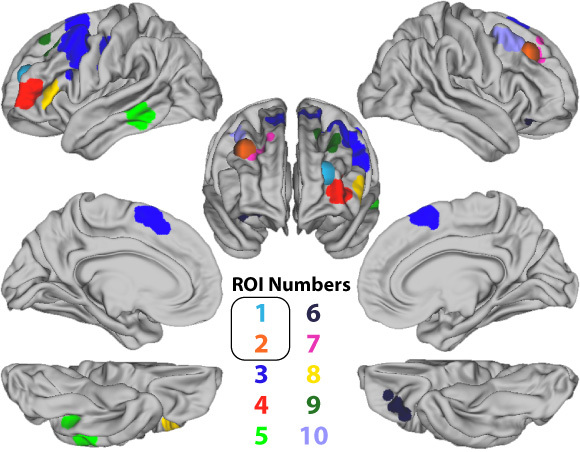 The global connectivity of this prefrontal region could account for 10% of the variability in fluid intelligence, while activity in this region accounts (independently) for 5% of the variability, and overall gray matter volume accounts (again independently) for an additional 6.7% of the variance. Together, these three factors accounted for 26% of the variance in fluid intelligence across individuals. There are several important questions that this study raises. For instance, does this region change its connectivity depending on the task being performed, as the “flexible hub” hypothesis would suggest? Are there other regions whose global (or local) connectivity contributes substantially to intelligence and cognitive control abilities? Finally, what other factors are there in the brain that might be able to predict fluid intelligence across individuals? We are rarely alone when learning something for the first time. We are social creatures, and whether it’s a new technology or an ancient tradition, we typically benefit from instruction when learning new tasks. This form of learning–in which a task is rapidly (within seconds) learned from instruction–can be referred to as rapid instructed task learning (RITL; pronounced “rittle”). Despite the fundamental role this kind of learning plays in our lives, it has been largely ignored by researchers until recently. My Ph.D. dissertation investigated the evolutionary and neuroscientific basis of RITL. RITL almost certainly played a tremendous role in shaping human evolution. The selective advantages of RITL for our species are clear: having RITL abilities allows us to partake in a giant web of knowledge shared with anyone willing to instruct us. We might have received instructions to avoid a dangerous animal we have never seen before (e.g., a large cat with a big mane), or instructions on how to make a spear and kill a lion with it. The possible scenarios in which RITL would have helped increase our chances of survival are virtually endless. There are two basic forms of RITL. When you type a search into Google it figures out the most important websites based in part on how many links each has from other websites. Taking up precious website space with a link is costly, making each additional link to a page a good indicator of importance. We thought the same logic might apply to brain regions. Making a new brain connection (and keeping it) is metabolically and developmentally costly, suggesting that regions with many connections must be providing important enough functions to make those connections worth the sacrifice. We developed two new metrics for quantifying the most connected—and therefore likely the most important—brain regions in a recently published study (Cole et al. (2010). 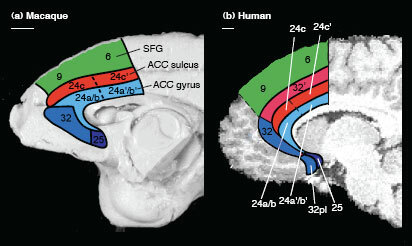 Identifying the brain’s most globally connected regions, NeuroImage 49(4): 3132-3148). We found that two large-scale brain networks were among the top 5% of globally connected regions using both metrics (see figure above). 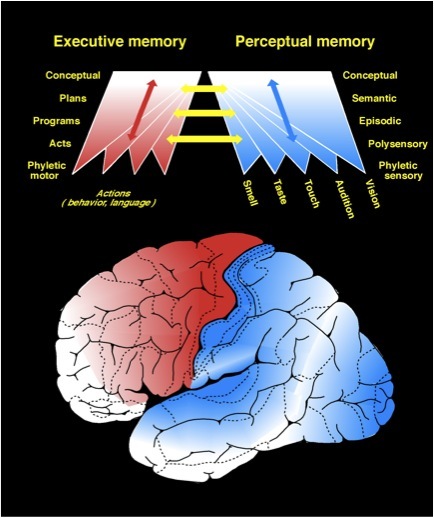 The cognitive control network (CCN) is involved in attention, working memory, decision-making and other important high-level cognitive processes (see Cole & Schneider, 2007). In contrast, the default-mode network (DMN) is typically anti-correlated with the CCN and is involved in mind-wandering, long-term memory retrieval, and self-reflection. Needless to say, these networks have highly important roles! Without them we would have no sense of self-control (via the CCN) or even a sense of self to begin with (via the DMN). However, there are other important functions (such as arousal, sleep regulation, breathing, etc.) that are not reflected here, most of which involve subcortical regions. These regions are known to project widely throughout the brain, so why aren’t they showing up? 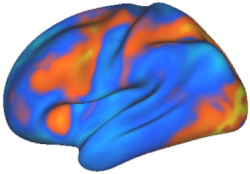 It turns out that these subcortical regions only show up for one of the two metrics we used. This metric—unlike the other one—includes low-strength connections. Subcortical regions tend to be small and project weak connections all over the brain, such that only the metric including weak connections could identify them up. I recently found out that this article received the 2010 NeuroImage Editor’s Choice Award (Methods section). I was somewhat surprised by this, since I thought there wasn’t much interest in the study. When I looked up the most popular articles at NeuroImage, however, I found out it was the 7th most downloaded article from January to May 2010. Hopefully this interest will lead to some innovative follow-ups to try to understand what makes these brain regions so special! Figuring out how the brain decides between two options is difficult. This is especially true for the human brain, whose activity is typically accessible only via the small and occasionally distorted window provided by new imaging technologies (such as functional MRI (fMRI)). In contrast, it is typically more accurate to observe monkey brains since the skull can be opened and brain activity recorded directly. Despite this, if you were to look just at the human research, you would consider it a fact that the anterior cingulate cortex (ACC) increases its activity during response conflict. The thought is that this brain region detects that you are having trouble making decisions, and signals other brain regions to pay more attention. If you were to only look at research with monkeys, however, you would think otherwise. No research with macaque monkeys (the ‘non-human primate’ typically used in neuroscience research) has found conflict activity in ACC. My most recent publication looks at two possible explanations for this discrepancy: 1) Differences in methods used to study these two species, and 2) Fundamental evolutionary differences between the species. Thousands of brain imaging studies are published each year. A subset of these studies are replications, or slight variations, of previous studies. Attempting to come to a solid conclusion based on the complex brain activity patterns reported by all these replications can be daunting. Meta-analysis is one tool that has been used to make sense of it all. Meta-analyses take locations of brain activity in published scientific papers and pool them together to see if there is any consistency. This is typically done using a standardized brain that all the studies fit their data to (e.g., Talairach). Activation coordinates are then placed on a template brain as dots. When dots tend to clump together then the author can claim some consistency is present across studies. 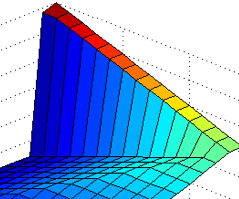 See the first figure for an example of this kind of result. More sophisticated ways of doing this have emerged, however. One of these advanced methods is called activation likelihood estimation (ALE). This method was developed by Peter Terkeltaub et al. (in conjunction with Jason Chein and Julie Fiez) in 2002 and extended by Laird et al. in 2005. 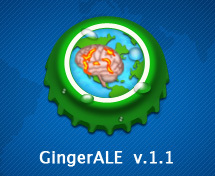 ALE computes the probability of each part of the brain being active across studies. This is much more powerful than simple point-plotting because it takes much of the guess-work out of deciding if a result is consistent across studies or not. 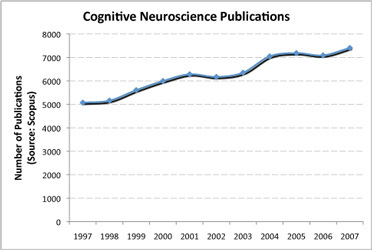 Keeping up with new findings is constantly becoming more difficult with the rate of publication in just cognitive neuroscience increasing by over 200 per year, with an overall increase of 2333 over the last ten years (see figure below). I will briefly describe some methods I’ve recently discovered to help deal with this onslaught of new information. I have found that using a combination of computer applications and websites can be effective for keeping up with science readings. The websites are useful for searching and subscribing to syndicated (RSS) feeds. The applications are useful for organizing articles. This website is extremely useful for exploring a comprehensive collection of research on a particular topic. It uses Google’s legendary indexing algorithms to make keyword searching a breeze, while browsing citation links can reveal a chain of publications on a topic. It’s also useful because citations can be quickly imported into programs like EndNote, and articles that are often unavailable on other websites are made available via Google’s indexing. Scopus is “the largest abstract and citation database of research literature and quality web sources”. It’s very useful for seeing all the papers that have cited a particular article, and all the papers that article has cited. Google Scholar also has this feature, but in my experience there are more false-positives than with Scopus. The consistent link, citation, and abstract-viewing interface makes Scopus often more effective than Google Scholar. July 21, 2008 September 21, 2016 by P.L. Causal understanding is an important part of human cognition. How do we understand that a particular event or force has caused another event? How do realize that inserting coins into a soda machine results in a cool beverage appearing below? And ultimately, how do we understand people’s reactions to events? In addition to studying causal understanding, it is probably just as important to study causal misunderstanding: that is, why do individuals infer the wrong causes for events? Or incorrect results from causes? Studying the errors we make in causal inference and understanding may help us discover the underlying neural mechanisms. It probably isn’t too difficult to imagine that progress on causal understanding, and improvements in our ability to be correct about causation, will probably be important for the well-being of humanity. But what kinds of experiments and methods could be used to human brain mechanisms of causal understanding? June 2, 2008 September 21, 2016 by P.L. 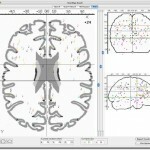 Computational models that are implemented, i.e., written out as equations or software, are an increasingly important tool for the cognitive neuroscientist. This is because implemented models are, effectively, hypotheses that have been worked out to the point where they make quantitative predictions about behavior and/or neural activity. In earlier posts, we outlined two computational models of learning hypothesized to occur in various parts of the brain, i.e., Hebbian-like LTP (here and here) and error-correction learning (here and here). The computational model described in this post contains hypotheses about how we learn to make choices based on reward. 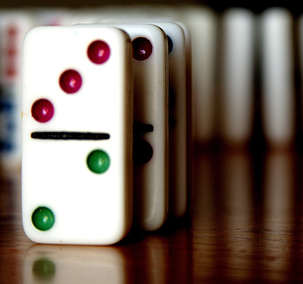 The goal of this post is to introduce a third type of learning: Reinforcement Learning (RL). RL is hypothesized by a number of cognitive neuroscientists to be implemented by the basal ganglia/dopamine system. It has become somewhat of a hot topic in Cognitive Neuroscience and received a lot of coverage at this past year’s Computational Cognitive Neuroscience Conference. May 30, 2008 September 21, 2016 by P.L. Cognitive neuroscience constantly works to find the appropriate level of description (or, in the case of computational modeling, implementation) for the topic being studied. The goal of this post is to elaborate on this point a bit and then illustrate it with an interesting recent example from neurophysiology. As neuroscientists, we can often choose to talk about the brain at any of a number of levels: atoms/molecules, ion channels and other proteins, cell compartments, neurons, networks, columns, modules, systems, dynamic equations, and algorithms. However, a description at too low a level might be too detailed, causing one to lose the forest virtual reality headset for the trees. Alternatively, a description at too high a level might miss valuable information and is less likely to generalize to different situations. For example, one might theorize that cars work by propelling gases from their exhaust pipes. Although this might be consistent with all of the observed data, by looking “under the hood” one would find evidence that this model of a car’s function is incorrect. I just got back from CNS a few days ago. I thought I’d write a quick summary of one of the more interesting symposia at the conference. Taking place Monday (4/14) afternoon, The rise and fall of cognitive control: Lifespan development covered how executive brain functions develop and peak in the 20s and 30s, falling again toward the end of life. The first talk, by Cindy Lustig, reported on a functional MRI study of 239 individuals ranging from 9 to 97 years of age. She found that the “default-network” brain activity (likely related to mind wandering) was better suppressed during difficult tasks early in life and decreased later in life. This suggests that difficulties older people have with hard tasks may originate in their poor ability to reduce background thoughts. Adele Diamond gave the next talk, which focused on an impressive preschool program that improves cognitive control in children to help them with future school success. The program, called Tools of the Mind, is based on research showing that self-regulation (i.e., cognitive control) is very predictive of future academic success. The program successfully integrates with the children’s play, and Dr. Diamond’s research shows convincingly that it is able to improve cognitive control and subsequent school success. The above photo is of two children “playing” the program’s ‘Buddy Reading’ task, which promotes inhibition of inappropriate impulses using a reminder icon held by the child in the role of listener (on the right in the above photo). The final talk, by Bradley Schlaggar of Washington University at St. Louis, described tracking changes in resting state connectivity with development. As presented by Steven Petersen at HBM 2007, Dr. Schlaggar showed how dorsal anterior cingulate changes its membership in networks over time. The idea of showing how regional membership in global networks can change with development is very exciting and will certainly lead to future insights into human developmental processes. I recently watched this talk (below) by Joaquin Fuster. His theories provide a good integration of cortical functions and distributed processing in working and long-term memory. He also has some cool videos of likely network interactions across cortex (in real time) in his talk.